Bf, ever the fanboy, wanted to attend Ambeth Ocampo's new lecture. I was impressed with the famed historian's previous lecture so I readily agreed. Ayala Museum was already bursting with people when we arrived. We had no choice but to stand at the back. No, Rizal was NOT Hitler's dad. Rizal has always been put on a pedestal by most teachers and historians. He was the perfect son, the perfect student, yadda yadda. He was virtually untouchable. Anyone who disagreed would be struck down and taken to a private field trip, never to be heard from again. Sure, Jose got involved with several girls but those girls were more of admirers who our hero found impolite to turn down. Jose was always serious and pure. He wouldn't have become as great as he was if he wasted time with vices or clowning around. In Ambeth's lecture, he took Rizal off his pedestal and put him in the same room as us. We realized that Rizal was not perfect. He was not a demigod, but a human being just like us. He joked around, ribbed his friends, engaged in activities his parents would not have approved of. He didn't walk majestically, living and breathing heroism every freaking day. He also had his share of doubts and regrets, as well as cowardice when it came to romantic matters, which led to a string of broken-hearted women. In short, he was normal. The audience appreciated this approach in tackling Rizal's private life. It was refreshing and inspirational to know that we flawed mortals could be awesome too. After all, Rizal is a hero, not a god. What good is a hero if his greatness can't be emulated, right? Aside from the lecture, we also got Ambeth's new book Chulalongkorn's Elephants. 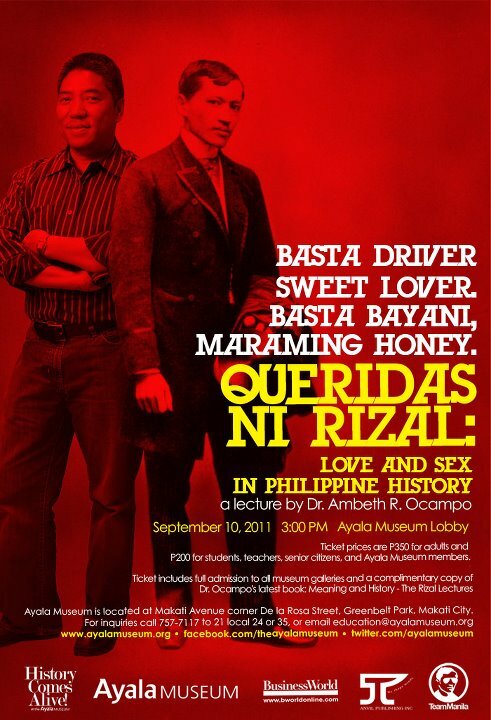 You can find pictures of the Queridas ni Rizal lecture at the Ayala Museum's Facebook page. I've always loved Rizal back in HS & College. Although he may have been painted a picture of being the 'Perfect Person', I've always known that he was also flawed. No one's really that perfect. 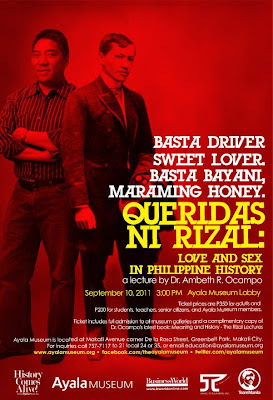 :P Sayang, would've loved to hear Ambeth talk about Rizal rin. Honestly, Rizal lectures bored me to the bones! I only had a good time when I was in high school, when our teacher talked about his "normal life" instead of the heroic side. This book sure is interesting. I love Ambeth Ocampo's different take on Philippine history. He always manages to make it very contemporary. i have always wanted to attend lectures of Ambeth Ocampo but didn't have a chance until the Rizal @ 150 Passport launched. Embarking on this journey that retrace our national hero's steps both here and abroad helped me to see and know the pre-national hero Jose Rizal and i appreciated him more now that i see him as a person just like me -or any of us!!! Your journey is pretty amazing. You get to see the things that Jose Rizal experienced during his lifetime. Yup his contributions were really remarkable. he would not be considered BABAERO. modern MAGINOO pero medyo BASTOS. Nakaka curious. As in hindi seryosong Rizal. That's nice. Well a bit trivial but Chulanglongkorn's Elephants refer to bronze elephants that the King of Thailand gave Singapore and Indonesia in 1871. The book's first essay touched on the royal visits to colonial Philippines.